The further technology advances, the more everyday items start coming equipped with Wi-Fi capabilities and a whole host of smart functions. 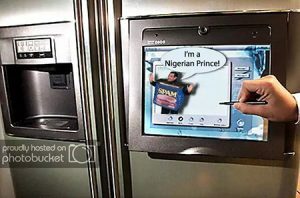 Hackers know that smart appliances can be just as vulnerable as any other computer- which is just how hundreds of thousands of people found their inboxes spammed by televisions and refrigerators. California security firm Proofpoint claim to have discovered a huge “botnet”- that is, a network of infected computers which hackers use to send out malicious emails. The strange thing about this particular botnet is that it was made not of infected desktops and laptops, but internet-connected appliances such as smart televisions. Security researchers at Proofpoint announced that over 750,000 emails were sent out in the attack, making this the first known case of an “internet of things” cyber-attack. Hacking attacks making use of internet-enabled devices have been theorized about by experts for some time, with many researchers advocating better security measures for smart device owners. According to Proofpoint, the use of smart devices in a botnet attack “has significant security implications for device owners and enterprise targets.” With internet-enabled devices, and even wearable technology becoming more and more commonplace, there will soon be many more targets for hackers to take advantage of.